The royal residence till the year of 1991, Sharad Baug Palace is set in idyllic gardens. The last royal resident of the palace was Madansingh and the palace was converted into a museum after his death. As you walk in, you will be welcomed by beautiful flower beds and medicinal plants surrounding the building. The building is different than the rest of palaces in India, influenced by Indian and Italian style of architecture. The palace museum houses a bunch of collectibles of the royal family including intricately decorated carpets, weapons like spears and swords and the fur of the animals hunted on various occasions. The entire structure and its interiors, including the furniture have a strong Italian influence. Visit the museum, observe the royal artefacts and walk around the winding pavements of the garden lined with palm trees! Extra fee may be required for photography. By hired car or auto. Love this? Explore the entire list of places to visit in Bhuj before you plan your trip. Fancy a good night's sleep after a tiring day? Check out where to stay in Bhuj and book an accommodation of your choice. 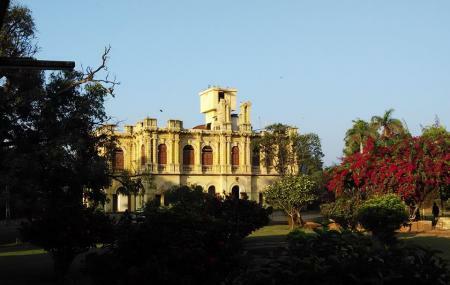 How popular is Sharad Baug Palace? People normally also visit Bharatiya Sanskruti Darshan Museum while planning their trip to Sharad Baug Palace. Must visit place. Very beautiful environment and too much of greenery. Neat and clean atmosphere. Three hours of lunch time is the biggest drawback of this place. Palace is beautiful and garden is superb. There are hundreds of BAT hanging on the tree branches giving you a scared look. A prominent tourist place. Excellent garden. If you don't visit this place at Bhuj you will denefitley miss something. Ticket fees are nominal and photography partially allowed. This place is partly resided by the Royals. It will take about 3 to 4 hours to make a satisfactory visit so plan in advance. Wonderful place, in the middle of bhuj city.. Gud home stay service available in the lap of nature,..